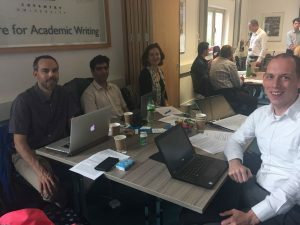 On Friday the 8th of June the ColloCaid team took part in the BAAL Corpus Linguistics SIG Event ‘New Directions in DDL’. In our presentation New directions in DDL for EAP writers we presented the ColloCaid tool as a means of Data Driven Learning; helping learners engage with corpus data dynamically in such a way that learners do not get lost or distracted in the process. We demonstrated how ColloCaid integrates user needs, curated corpus data and human-computer interaction to make DDL maximally relevant and minimally distracting to writers.